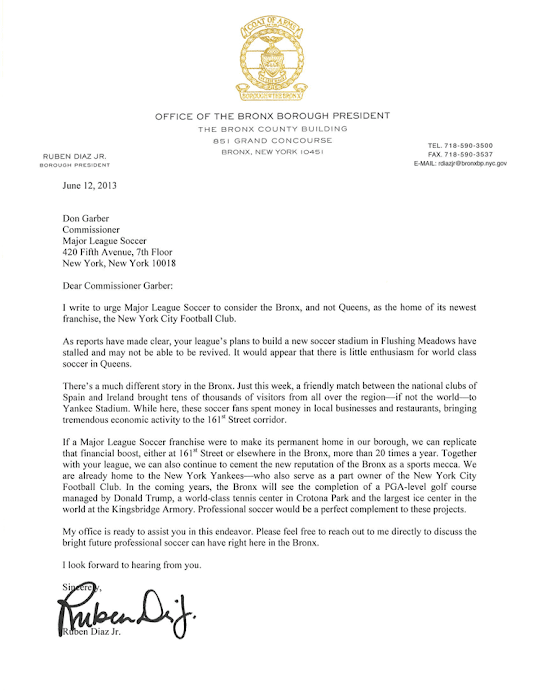 I write to urge Major League Soccer to consider the Bronx, and not Queens, as the home of its newest franchise, the New York City Football Club. As reports have made clear, your league's plans to build a new soccer stadium in Flushing Meadows have stalled and may not be able to be revived. It would appear that there is little enthusiasm for world class soccer in Queens. There's a much different story in the Bronx. Just this week, a friendly match between the national clubs of Spain and Ireland brought tens of thousands of visitors from all over the region—if not the world—to Yankee Stadium. While here, these soccer fans spent money in local businesses and restaurants, bringing tremendous economic activity to the 161th Street corridor. 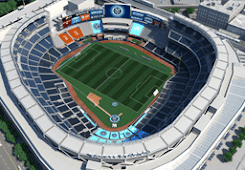 If a Major League Soccer franchise were to make its permanent home in our borough, we can replicate that financial boost, either at 161th Street or elsewhere in the Bronx, more than 20 times a year. Together with your league, we can also continue to cement the new reputation of the Bronx as a sports mecca. We are already home to the New York Yankees—who also serve as a part owner of the New York City Football Club. In the coming years, the Bronx will see the completion of a PGA-level golf course managed by Donald Trump, a world-class tennis center in Crotona Park and the largest ice center in the world at the Kingsbridge Armory. Professional soccer would be a perfect complement to these projects. My office is ready to assist you in this endeavor. Please feel free to reach out to me directly to discuss the bright future professional soccer can have right here in the Bronx. Well. The gauntlet has been thrown down. I would expect the Yankees to leverage their relationship with the Bronx to get a stadium built, but it appears that Diaz is trying to leverage his relationship with the Yankees in the exact same way. I wonder where in the Bronx they could build it? I like the idea of building a sports district near Yankee Stadium, but don't know where they could find the land in such a developed area. There's enough lingering animosity over the Yankee Stadium parkland giveaway to make a repeat politically impossible.